Xiaomi doesn’t want to miss the 5G bandwagon — the company just unveiled its first smartphone that comes with a 5G modem at a press conference in Barcelona. The Mi Mix 3 5G is a new variant of the Mi Mix 3, a phone that Xiaomi originally released in October 2018. The company is trying to create a bezel-less phone with the Mi Mix line. Instead of a notch or a punch-hole display, Xiaomi has opted for a sliding front-facing camera. The result is a 93.4 percent screen-to-body ratio. You can find two cameras on the back of the device, which give you the ability to shoot slow-motion videos at 960 frames per second. The handset body is made of ceramic. There are a few changes in the new device. First, Xiaomi has swapped the Qualcomm Snapdragon 845 system-on-a-chip with a Snapdragon 855 system-on-a-chip — the same chipset you can find on the Samsung Galaxy S10. When it comes to the modem, the company is using Qualcomm’s X50 5G modem. It’s always hard to grasp the advantages of 5G. That’s why Xiaomi’s Director of Product Management Donovan Sung started a video call with one of its telecom partner, Orange Spain. There was some latency and it wasn’t that convincing. At launch, Xiaomi is partnering with Orange, 3, Sunrise, Telefonica, Tim and Vodafone. The device will be available in May for €599 ($680) in two colors — Onyx Black and Sapphire Blue. Let’s see if any 5G network will be ready by then. 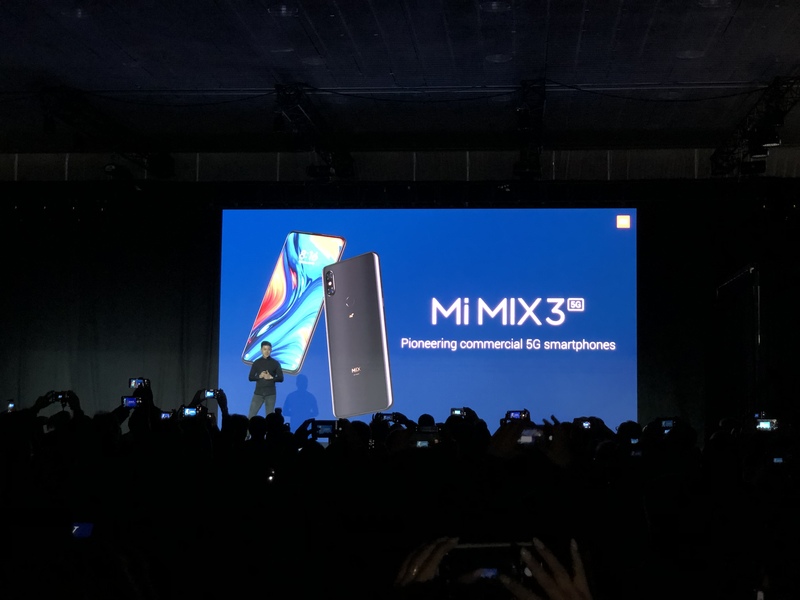 Chipmaker Qualcomm’s president, Cristiano Amon, stole a little of Xiaomi’s thunder by naming the Mi Mix 3 5G first during a turn on stage at the press conference as a Xiaomi partner. Amon took the opportunity to give a muscular sales pitch for 5G, claiming the next-gen cellular tech would come faster than the transition from 3G to 4G/LTE and bring transformative benefits for consumers — touting the likes of premium gaming on mobile to replace game consoles. That’s because 5G should greatly lower latency and improve online gaming. “5G is here. Not in 2020, not in late 2020 – it’s here right now in 2019. 2019 is the year of 5G,” he claimed, suggesting 5G device launches would be fast-followed by commercial 5G services as early as the second half of this year. On device AI will also get a boost from 5G, Amon suggested, arguing that “every” app will be able to leverage machine learning thanks to reduced latency. “You can unleash the power of the cloud for every app and service,” he said. 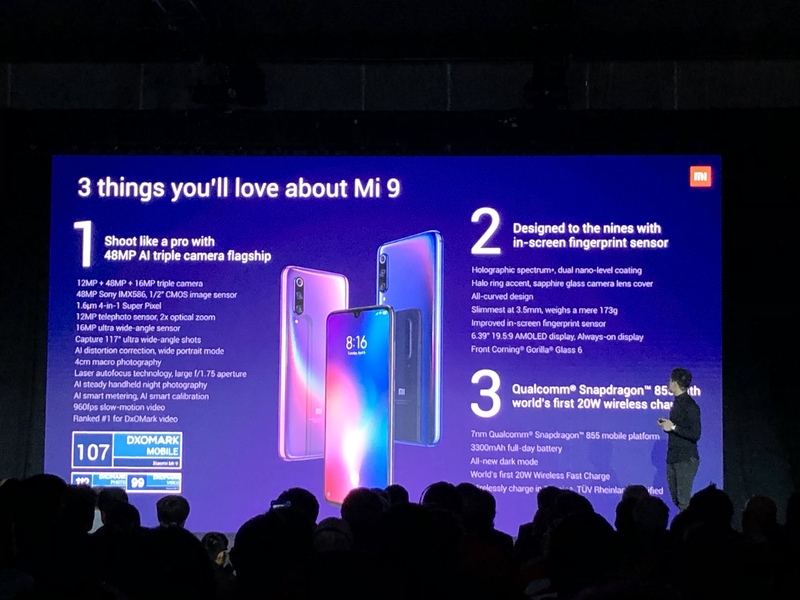 Xiaomi also used its first MWC new product launch event opportunity to announce the Mi 9 once again. The company has already unveiled its new flagship device earlier this week. It’s a more traditional phone with a waterdrop-shaped notch, a Snapdragon 855 chipset and a triple camera system. You can find a 48-megapixel camera, a 16-megapixel wide-angle camera and a 12-megapixel telephoto camera on the back of the device. The Mi 9 will be priced at €449 ($510) for 6GB of RAM and 64GB of storage, €499 ($565) for 6GB of RAM and 128GB of storage. Pre-orders start from today in select European markets — devices should ship by February 28. There are now 224 million monthly active Xiaomi smartphone users globally. While Xiaomi phones aren’t available in the U.S., you can now buy Xiaomi phones in Spain, the U.K., France and Italy in addition to many Asian markets. It singled out electric scooters to say it’s shipped more than 560,000 Mi scooters to date. The Mi scooter was “probably the best selling personal transportation device in the world in 2018”, it added. 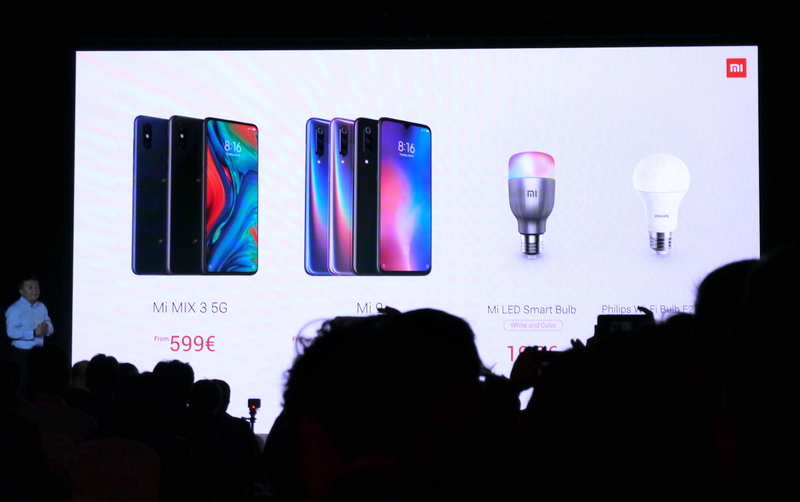 At the event it also announced the launch of another new product: The Mi LED Smart Bulb — a connected light bulb that lets users control light color and brightness via their phone. It’s priced at €19.90. The company tried to demo its smart home ecosystem but failed to turn off the air purifier using Google Assistant. Xiaomi didn’t say a word on its foldable smartphone. It looks like there’s still some more work to do on the device.